Farm to Table Fall Harvest Dinner featuring Poughkeepsie’s authentic Italian delicatessen, Rossi’s. .
End of the year Harvest Dinner: A 6 course dinner created and prepared by those Famous Rossi Brothers of Rossi's Rosteccaria Deli located in Poughkeepsie New York. You must come hungry. Seats go fast for our dinners. If we sell out you may call us to be placed on a waiting list at (845) 256-1592. A sparkling beverage and a walking tour of the farm with our farmer then we sit down to dinner. Antipasti Station: Made-to-Order Fresh Mozzarella Knots with Balsamic and Olive Oil; Arancini with herbed farmer's cheese. Braised Rabbit, Wild Mushrooms and Fresh Herbs in Pasta Sfoglia. Maravilla de Verano Lettuce, Roasted Fall Vegetables, EVOO vinaigrette, Ricotta Salata. Beef Braciole, Minestra e Fagioli con Prosciutto, Herb and Cheese Polenta. Rossi's Signature Warm Bread Pudding with Panettone and Orange Flower Blossom Glaze. All vegetables from Taliaferro farms. All pasture raised meats sourced from local farms. Reservations will be limited to 25 people. 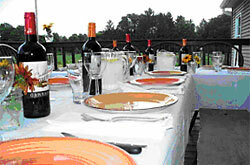 Please check our blog to find out how our Farm-to-table dinner came about.